-Bob takes Helen hostage in Jim's car. Dorothy asks if Phoebe would like to go over to the Robinsons. Phoebe declines, saying that everyone will either be talking about Todd or trying really hard not to but says that Dorothy can go if she likes. Dorothy points out that a wake can do a lot of good. Dorothy explains how upset she was over her mother's sudden death, but talking to those who loved her turned the wake into a celebration of her mother's life. 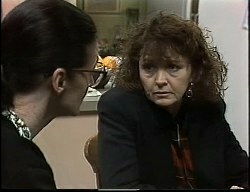 Dorothy reckons that speaking to Jim, Helen and Annette might really help, but Phoebe is reluctant. She admits that Dorothy might be right, but she just wants to be alone for a while. Jim, Paul, Cameron, Doug and Beth all return. Paul is anxious that they should do something, but Jim points out that the police have told them to leave it to them. Jim reminds Paul that Bob has a gun, and he doesn't want his family or his friends put into danger, as they've already lost enough this week with the death of Todd. Paul is gobsmacked - Helen's already in danger! Pam arrives with Annette, who wants to lie down as she has a headache. Helen is driving. She asks Bob where they're going, and he says they're going a long way from here. She asks if it'd be faster on the freeway, but Bob wonders if she thinks he was born yesterday - the police will have the main roads covered. Bob tells Helen not to try anything stupid because the last thing he wants to do is hurt her but if he has to, he will. Helen is appalled at Bob's actions - and at his own son's funeral! She says that Bob has never given a danm about Todd and he's only ever been interested in himself. Bob gets morose and says how much he loved Todd. Helen takes her chance and suggests going back to a phonebox they passed so that they can call Cameron - his lawyer - and sort things out. Cameron tells Jacqueline that they can't afford to sit on their hands, as the police won't be. Cameron asks for information on Paxton's associates or business partners. Jacqueline can't think of anyone. Cameron pushes the point and tells her that the police are convinced that she's responsible, so they're not looking for anyone else - their energies are going into finding something against her. Their best - and possibly, only - bet is to find the real accomplice. Jacqueline insists she can't think of anyone. Cameron pushes the point again. Jacqueline asks what's got into Cam and moves over towards him. He tells her that he's her lawyer now and any feelings they may have for each other will just cloud the issue. She says she can't pretend those feelings don't exist but Cameron tells her she's got to, at least for the time being because if they don't get her off, she could be facing a heavy sentence. Jacqueline says she thought Cameron told her they didn't even have a case. Cameron says they have Paxton's statement and if they wanted to, they could hold her on that but they're trying to find something stronger to go to trial with. Jacqueline exclaims that she hasn't done anything. Cameron tells her he knows that but they probably want her to incriminate herself somehow. He tells her they have to build as strong a case as they can in the time they have left which doesn't leave any room for romance. Another car is travelling through the bush - and it holds the Martin family! JULIE: We've well and truly missed Todd's funeral by now! PHILIP: Calm down, Jules. There's nothing we can do about it. JULIE: I don't know why you had to get off the freeway. PHILIP: You heard the radio - the traffic's terrible! PHILIP: I just thought the way would be better signposted! It looked simple enough on the map. Julie spies a phonebox and tells Philip to pull over so she can call Jim. Paul can't believe they haven't heard anything yet. Pam says that Bob's had plenty of practice at hiding out. The phone rings - it's Julie, apologising for the fact that Philip got them lost! Jim confirms they've missed the funeral. Hannah asks to speak to Jim, but when Paul hears, he tells Jim that they should keep the phone free. Hannah asks Jim if she can speak to Helen and Jim pretends that she's busy and asks to speak to Julie. 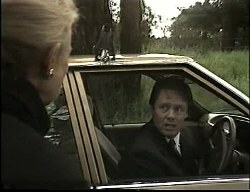 Julie tells Jim that they'd best get off, and Jim hangs up. Everyone looks at him expectantly, but Jim says that he couldn't bring himself to tell them what's happened to Helen. 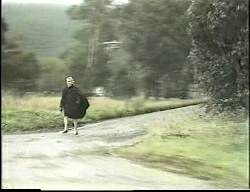 Bob makes Helen pull over and then orders her out. He tells her that he's dumping her - and by the time she reaches a farmhouse or a petrol station, he'll be long gone. HELEN: You can't just dump me out here in the middle of nowhere! BOB: I can and I am! Helen protests that she hasn't fully recovered from her hip operation, so she can't wakl any distance. Bob tells her that she'll have to wait for a car to come along. Helen points out that they haven't seen another car in the last hour! She pleads with him to give herself up, but Bob says it's too late. He apologises for all of the trouble, and he asks her to organise a stone for Todd's grave so it's not left unmarked. Helen agrees. Bob says that even though he's not seen much of Todd recently, he'll really miss him. HELEN: We'll all miss him. Phoebe is sorting through everything she has to do with Todd. She looks at a few photos of them together, and Dorothy asks if she can help. Phoebe declines, saying it's something she has to do herself. Dorothy asks about a letter. Phoebe tells her it's the most important part - it's what got her and Todd together in the first place. She wrote the letter to him whilst he was in Adelaide, telling him how she felt about him - how she loved him. He almost didn't get it due to mix-ups with Toby and Josh. Phoebe says that she was so embarrassed about it when Todd finally got it, she told him it was a joke and says that it's amazing they ever got together at all. Dorothy tells her that love finds a way. Phoebe agrees and says that she wants their daughter to know as much as possible about her father, about what a wonderful person he was. Phoebe says that she's glad she's having the baby now - for his sake. Dorothy doesn't look quite as convinced. Pam pops over to see how Phoebe is doing. Dorothy tells her what Phoebe is doing with Todd's things, and keeping them all for the baby. Dorothy tells Pam that Phoebe is keeping the baby out of devotion to Todd. Dorothy tells her that Phoebe is a bright girl who could do anything she set her mind to but as a teenage single parent, her options are greatly reduced. Pam says she just might need some more time. Dorothy asks how things went over at the Robinsons, apologising for not making it over to the wake. Pam realises she hasn't heard about Helen and tells her that it's been a terrible day. The Martins are still driving. JULIE: All right, Marco Polo, where in blue blazes are we now?! PHILIP: Relax! I mapped out a route while you were buying us lunch. We should be coming across a town in about 20ks. JULIE: It'll probably turn out to be a ghost town! Debbie is really bored, and Phil tries to convince her that they're driving through beautiful countryside and people pay big bucks to do what they're doing. PHILIP: Look at that! Spectacular! DEBBIE: It's a hill. With some trees on. Whilst Phil and Debbie are arguing, Hannah spies Helen out of the window but nobody else notices. Hannah insists that she saw Granny Helen, but Julie tells her not to be silly. Phil and Julie point out that she hasn't seen Helen for ages, except in photos, so it's probably just a farmer's wife who looks a bit like her. Phil changes the subject. PHILIP: Why don't we play I-spy? I'll go first. I spy with my little eye, something beginning with W.
DEBBIE: Dad! You always start with windscreen! PHILIP: ...it could've been wheel. Debbie declines her go at I-spy and Hannah starts up again about Helen. Julie tells her to stop being silly - Jim said that Helen was at Number 26, so Hannah can't have seen her. Everyone is sitting around. 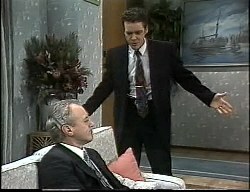 Paul is frustrated, and Jim suggests that he go home to Chrissie and Andrew. Paul says he wants to stay. PAUL: If Bob Landers harms one hair on her head..
JIM: I know. That man has been a millstone around this family's neck, especially for Todd. Cameron says that the police picked up Paxton via an anonymous tip off. Cameron says if they find out who the call is from, they've found the accomplice. The accomplice has the most to gain from Paxton being arrested, as he gets to keep all of the money, rather than a 50/50 split. Jacqueline remains unconvinced. Paxton must trust the accomplice - else he'd give their name to the police instead of hers. Cameron agrees, saying that he would've double-crossed them before they could double cross him and he'd have all the money. Cameron bets that he's kicking himself now because he should've known there's no honour among thieves. Cameron still thinks that it's a break - especially if they can track that caller and get some names. Phil is turning the car around. PHILIP: There was a town on the map. JULIE: What was it called? Brigadoon?(!) At this rate, we'll still be driving around next century when it re-appears. PHILIP: It was on the map! JULIE: It might have been on the map but it isn't on this road. PHILIP: I can't understand it. JULIE: It's simple. We're lost again. HANNAH: Are we going to find Granny Helen? JULIE: We're going to find whoever you saw, sweetheart and ask them how to get to Erinsborough! As they drive, they see Helen walking in front of them. PHILIP: That is Helen, isn't it?! HANNAH: See, I told you! The family pile out of the car, and Helen is stoked to find it's them. They ask what she's doing in the middle of nowhere and Helen says it's a long story. Hannah asks if Helen ran away from home! Jacqueline tells Cameron that she can't help thinking that the caller didn't have anything to do with the robbery. Jacqueline asks why not, saying that's what Cameron would do if he knew the whereabouts of a criminal. Cameron agrees but doesn't understand why anyone would keep anonymous unless they had something to hide. She says they might just not want to get involved. Cameron agrees that it's possible - anything's possible. Jacqueline says she doesn't want him to be too disappointed if his theory doesn't amount to anything. Cameron says he's still hopeful. Cameron says he'll see her tomorrow afternoon. She thanks him for spending so much of his time with her. She asks if it'd be totally unethical for her to give her lawyer a kiss on the cheek for all his hard work. Cameron says it would be, a little bit, but he could overlook it. She kisses him on the cheek and they stare into each other's eyes. Annette has popped over. 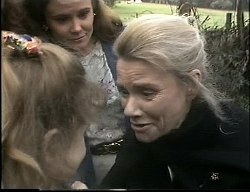 She tells Dorothy that the Martins have picked up Helen, and she's fine. Dorothy thinks it's a stroke of luck that they came along. ANNETTE: Yes. I think she should buy a lottery ticket! Annette asks after Phoebe and Dorothy says that she hasn't been told about Helen, as she didn't see the point of upsetting her anymore. Annette says that it was probably a good idea and now there's no reason for her to know - at least, not yet. Dorothy agrees and Annette says that she wanted to see Phoebe before she left. Dorothy calls for Phoebe and Annette tells her that she's not staying overnight because she doesn't want to leave Katy on her own. Phoebe and Annette hug and Annette tells her that she wishes they'd met some other way. She says that if Phoebe ever wants to come to Adelaide, they'd love to see her and that she promises she'll return to Erinsborough when the baby's born. Phoebe says she'd like that and Annette tells her that she feels that with the baby, a part of Todd lives on and she's glad Phoebe decided to have it. The two hug again and Dorothy looks on, not looking as convinced. Paul's on the phone relating the good news, saying that Helen and the Martins are due soon - they've had to go to the police station and make a statement. Pam and Doug make tracks to leave - but as they go to exit, the Martins and Helen arrive. Helen tells Paul that she's fine. HANNAH: Grandad, Grandad, I found Granny Helen! HELEN: Yes, if it were not for Hannah - and Philip's sense of direction - who knows where I'd be now? PAUL: Still get lost on the way to the shops, do you, mate? PHILIP: I'm sure they keep moving them, Paul! Everyone laughs. Jim introduces everyone - and Julie mentions that Des Clarke used to live in the Willis' house. Pam promises to drop around the following morning to see how Helen is and both she and Doug depart. Jim asks if he can get anyone anything and Helen says that she's fine but the Martins are starving. Beth takes Hannah and Debbie into the kitchen to get some sandwiches that are left over whilst Phil takes Paul up on his offer to help unload the car. Julie, Helen and Jim are left alone and Jim asks how it went with the police. Julie says they weren't kept long and Helen adds that she didn't think she was much help as Bob didn't give anything away. Jim says he hopes that's the last they'll see of Bob Landers - a point Helen agrees with! Cameron apologises to Pam and Doug for shooting off whilst it was all still fairly tense - he had to have a meeting with Jacqueline. PAM: Oh. How's all that going? DOUG: She's a good looking woman, Jacqueline. DOUG: We *know* you've noticed. Cameron tells them they're keeping things strictly professional until they can get it all cleared up and then they can relax. DOUG: Relax?! I don't think I've heard it called that before! The phone goes. Cameron tells the caller not to worry - he'll be right there. CAMERON: Jacqueline's just been arrested. CAMERON: I'll have to go down the police station. Cameron gets ready to leave and remarks that the police must've found something.